There is already little doubt Shaun Burgoyne is a future member of the Australian football hall of fame. This season, any lingering case against will be extinguished. Burgoyne is one of the last remaining veterans of the mid 2000s era – and one of the final veteran links to Hawthorn’s golden era. He’s played 342 games, and if he continues his recent trend of playing every game in every season, Burgoyne will be on the verge of joining the top 10 all time games played list come the end of 2018. The maestro will also play his 200th game for the Hawks some time this year, a feat no one – not even he – would have anticipated when moving over from Port Adelaide at the end of the 2009 season. In a four team trade, Hawthorn gave up Pick 9, Pick 89 and Mark Williams for Burgoyne and Pick 58. The good folks over at Hurling People Now peg the Burgoyne trade as Hawthorn’s second best in the modern era – behind their trade for Josh Gibson. It was far and away Port Adelaide’s worst, and doubly so given the players the Power selected with the picks they gained. 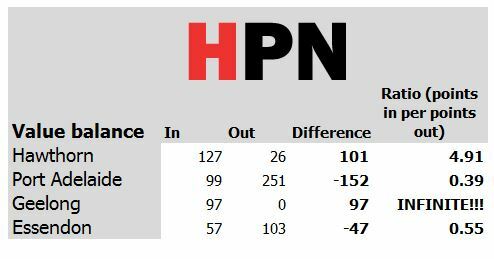 As it has turned out, Hawthorn picked up 4.9 points of value for every point they gave out in the trade. Since the trade Burgoyne has added three premiership victories to his chip from Port Adelaide, and played 185 out of a possible 196 games. The last 106 of those games have been consecutive, a streak which Burgoyne has built from the age of 30 years and 286 days. Extraordinarily, Shaun Burgoyne has the third longest active consecutive games played streak in the league. Shaun Burgoyne is also 35 years old, and the oldest and most experienced player in the league. The other 35 year olds in the league are mostly washed up (Aaron Sandilands), mostly mortally injured (Dale Morris), or mostly Jarrad Waite (Jarrad Waite). This simply should not be. And he’s not loping around the ground on a walking frame, either. Burgoyne has transitioned to Hawthorn’s half forward line, using his nifty bodywork to punk all manner of fool who dared think they can stop him in his first three outings of the year. Including his two JLT series games, Burgoyne has averaged 17 disposals, 2.7 shots on goal and two thirds of an assist per game. It marks the latest in a series of positional shifts Burgoyne has taken during his career, and looms as one which could keep him in the game for a while yet. His craftiness both with and without the ball are perfect for the flexibility demanded in a 2018 forward line. Burgoyne can spend patches through the middle, too, as he’s done with devastating effect in big moments throughout his time at Hawthorn. Silk as he’s known has proven to be one of the most consistent deliverers of a football in modern football. His career giveaway rate – discussed here – is 5.8 per cent, around three percentage points (or 33 per cent) better than the league average. He gives the ball away just a shade over once a game – quite staggering given the extent to which he is relied upon to make the big play. And there have been few games where he’s gone missing. Burgoyne’s last game with less than ten disposals came in Round Six 2007 – yes, almost 11 seasons ago – while he dipped below 15 touches just once in 2017. And even then, Burgoyne made an impact: 13 disposals, two goals and five tackles. Burgoyne has been on annual contracts every year since 2014 – he’s been a year to year prospect for five straight seasons – and at no stage has looked like the end is nigh. His hall of fame case rests on two aspects of his career. First, the number of games played. It seems crude, but a cursory glance at the list of Australian Football Hall of Fame members reveals every player that sits above Burgoyne on the leader board who has been out of the game for a long enough time has been inducted – except one. Brent Harvey, Dustin Fletcher, Adam Goodes and Matthew Pavlich are not yet in but certainly will be once further time has passed. The man who isn’t is Fitzroy/North Melbourne player John Blakey. Second are premierships. While football is a team game, and individuals don’t win premierships, the title “premiership player” is looked upon as an individual honour. If you believe Chris Judd, it also means you’re more likely to protect your spawn from the rampant masses of uncouth “normies”. Burgoyne has been involved in four premierships, across two clubs, and separated by nine years from start to finish. Few players are involved in four premierships, fewer at more than one club, and fewer still that don’t end up in the marble hall of AFL House. But perhaps the most important reason we should savour Burgoyne is time. We aren’t likely to see another player pass the 350 game milestone as he will do in 2018 for at least three seasons. Brendon Goddard (313 games) was apparently close to pulling the pin last season. Luke Hodge (306) will get to 350 if he plays every game for Brisbane for his two year contract. Gary Ablett (303) would take close to four years to get to 350 based on his recent history. Jarrad McVeigh (301) was close to leaving Sydney last season. Kade Simpson, Jordan Lewis, Eddie Betts, David Mundy and Lance Franklin all sit in the next tier of between 270 and 285 games played, and the spacing gets a little larger as we go further down the list. The point is, Burgoyne’s career is a marvel that we should appreciate to its fullest while we still have the chance. Shaun Burgoyne is the modern maestro of the AFL – Ken described being schooled by him as like being lulled to sleep by a virtuoso violinist last year – his game full of half steps, baulks and precision kicks can only come with decades of dedication to his craft. He is captivating to watch, both when he’s part of the Hawthorn orchestra and when under the spotlight delivering his solo. It’ll be some time before he takes his final bow, but that day will inevitably come as it does for all. Let’s listen, with intent, while we have the opportunity.